Do those silly movements really make a difference? Here’s a list of some potential benefits of these ancient art forms. If you ever wondered what those seniors are doing so early in the park on Sunday and why are they moving extra slow…go join them! Those seniors are up to something and are probably doing a martial art known as Tai Chi, one of the most reputable Eastern techniques to prevent decline in the elderly in the West. What is not known is that Tai Chi is only a small branch of healing arts known as Qigong. These art forms are not only good for seniors, they’re good for anyone wanting to decrease stress, improve balance, get better sleep, be more coordinated, keep a good posture and gain more flexibility and strength. Qigong started 4,000 years ago and grew to have hundreds of schools in Chinese medicine. It’s a practice that focuses on aligning breath with movement for healing and meditation and was highly used in the 60’s and 70’s during the Cultural Revolution in China due to the population’s need of healthcare. Today millions of people throughout world practice Qigong. What’s the difference between the Tai Chi and Qigong? Both Tai Chi and Qigong include body posture adjustment, gentle movements in laying, sitting, standing, or walking, as well as meditation and purposeful relaxation and breath regulation practice. Lowered cortisol levels during and one hour after practice. Increases self-efficacy with the slow movement by movement progression learning method. Increased oxygen transport and cardiorespiratory functioning. Improvements in anxiety and depression have been found in the elderly and in hyperactive children. Though many benefits have been reported from the research on Tai Chi and Qigong there are some variables that make it difficult to gain consistent knowledge. A large number of studies have methodological deficits including poor sample sizes. 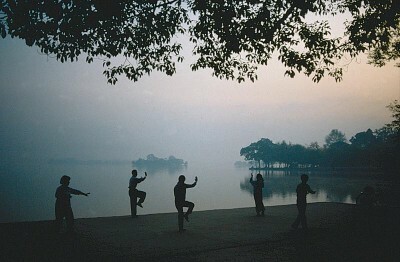 The variety of Qigong and Tai Chi forms make it difficult to gather data. Preconceived notions of the effect of Tai Chi and Qigong may create a placebo effect. Charisma and style of the teachers may also influence the impact of Qigong practice. Differences between Eastern and Western philosophies about health and medicine limit research. An example of this difference is traditional Chinese medicine does not view mental health as a separate clinical realm, unlike healthcare in the United States. Lastly, very few studies are specifically on the effect of Qigong on mental health patients in the United States. Even though there are these challenges in the research, doing a physical activity that is safe and has a positive impact on your mood is a step in the right direction regardless. So whether you are young or old, join that Sunday group and get down with those beautiful and silly movements. Ai, A. (2003). Assessing mental health in clinical study on qigong: between scientific investigation and holistic perspectives. Seminars In Integrative Medicine, 1(2), 112-121. Chan, E. S., et al. (2013). Biochemical and psychometric evaluation of self-healing Qigong as a stress reduction tool among first year nursing and midwifery students. Complimentary Therapies in Clinical Practice, 19(4), 179-183. Gallagher, B. (2003). Tai Chi Chuan and Qigong: physical and mental practice for functional mobility. Topics in Geriatric Rehabilitation, 19(3), 172-182. Jimenez, P. J., Melendez, A., & Albers, U. (2012). Psychological effects of Tai Chi Chuan. Archives of Gerontology And Geriatrics, 55(2), 460-467. Palumbo, M. V., Wu, G., Shaner-McRae, H., Rambur, B., & McIntosh, B. (2012). Tai Chi for older nurses: a workplace wellness pilot study. Applied Nursing Research, 25(1), 54-55. A young occupational therapy practitioner who is aspiring to write children's books and design video games. She gains inspiration from life experience, knowledge about psychology, health, friendship, nostalgia and San Francisco. Her role models are the story and atmosphere of LittleBigPlanet, Knytt, Katamari and Zelda, the art direction of Michel Gondry, the writing style of The Book Thief, the pure imagination of Roald Dahl and Adventure Time, and the depth in simplicity and innocence of Miyazaki films and Calvin and Hobbes. This entry was posted in Wellness and tagged Qigong, Tai Chi. Bookmark the permalink.